Every year, hundreds of thousands of people pour into our fair city to celebrate Boston Marathon weekend! We have a lot going on, and there is so much to do in the city of Boston! Here’s a quick guide to help you get around during your visit. 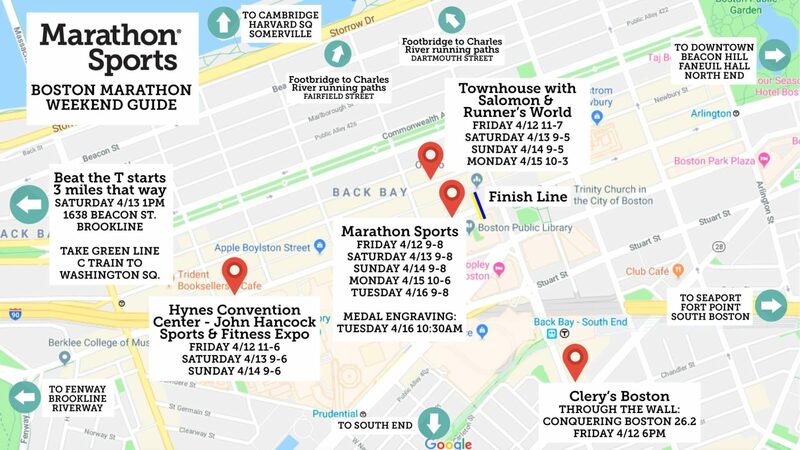 MARATHON SPORTS BOSTON – Our flagship store, located just a few yards from the iconic Boston Marathon finish line! Open all weekend and stocked full with the full 2019 Boston product collection. On Tuesday morning, get in line early to get your finisher medal engraved! JOHN HANCOCK SPORTS & FITNESS EXPO – You’ll find us staffing a handful of booths here, including major footwear, apparel, and accessory brands. Come say hi! THROUGH THE WALL – Friday evening at Clery’s. Get your brain ready for race day with a look at the mental aspect of marathoning and insight into what makes the Boston Marathon unique. Check out all the info here. BEAT THE T – Take your shot against the Green Line! We’ll run from Brookline to Boston along the marathon route and see if we can beat the Green Line to the Hynes Convention Center. Check out all the info here. THE TOWNHOUSE – We’ve partnered with Salomon and Runner’s World this year for a fun pop-up shop on Newbury Street. There are tons of events taking place all weekend, but you’ll need to register in advance for some. Check out all the info here. CHARLES RIVER ESPLANADE – If you come to Boston, you have to run here. You just have to! Scenic views of the city if you’re on the Cambridge side, and lots of friendly runners. You can get across Storrow Drive to the river path by using the footbridges at Fairfield Street and Dartmouth Street. THE FENS – Run west toward Fenway Park and take a jog through this scenic urban oasis. Check out the Fenway Victory Gardens, which were created during World War II and are the only remaining Victory Gardens in the entire country! Take a right out of our store and you’re there in a mile or so. THE SOUTH END – One of the trendier neighborhoods, and we love to run along the wide streets and through the 11 residential parks. There are also a ridiculous amount of good places to eat here, so you can refuel after your run. Take a left out of our store and then a right on Dartmouth Street. Less than a mile later you’re in the South End.